Do you want to sew training pants for your potty-learning baby? We take a closer look a great pocket training pants pattern from Sew Can Do. From the Craftsy listing: "Make potty training a little bit easier on you both with the Sew Can Do Sanity Saving Training Pant Pattern! This PDF pattern is for making a customizable leak-proof training pant for toddlers. Besides getting a custom fit to your child's own unique leg and waist size, you can select favorite color/print combinations for inner & outer fabrics, elastic and closures!" 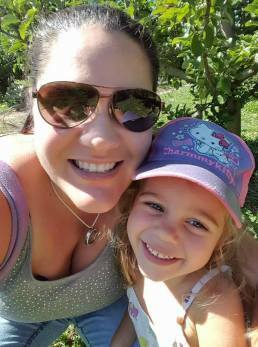 Potty training is an exciting milestone for both you and your little one! 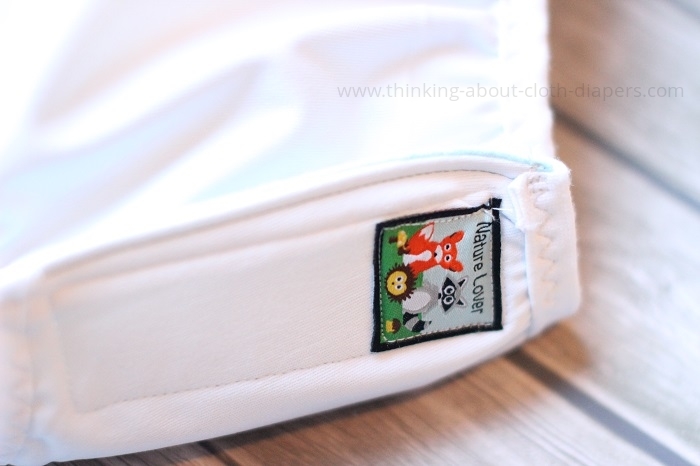 If your little one is showing signs of readiness for potty learning, our article on cloth training pants will help you understand why using cloth trainers (as opposed to disposable pull-up trainers) will speed up the process - and save you money, too! Even though cloth training pants will save you money, you might experience a bit of sticker shock when you first look into them. Most of the trainers on the market today run between $15 and $20 each... and your little one may only wear them for a few months at most! Setting aside a few hours to sew training pants for your little one can save you tons of money. 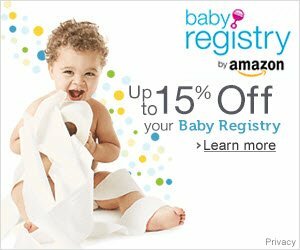 I figure materials will come in at less than half of the cost of buying trainers (even more if you buy your PUL on sale or by the yard rather than as diaper cuts!) - for 12 to 15 trainers, that savings can be upwards of $100. My first trainer with this pattern took me about an hour. Depending on your sewing experience, once you get comfortable with this pattern and can set it up "assembly-line" style, I would think that you could sew a dozen of these in a solid afternoon (3-4 hours). I'm definitely going to set aside some time to a few more of these before my little guy starts potty training! The Sanity Saving Training Pants pattern is designed to fit most children from 2-5 years with a weight range of approximately 22-35 lbs. Each pattern requires a diaper cut (20x20") piece of PUL and a similar piece of flannel, plus some fold-over elastic (2 yards) and either snaps (6 sets) or hook and loop tape (1/2 yard). The instructions indicate that if you prefer to purchase full yards of fabric, that you will be able to cut 4 trainers from a single yard each of PUL and flannel. Sew Can Do suggests that this sewing pattern is suitable for intermediate sewists - really, the pattern is very simple, but the techniques for working with PUL and fold-over elastic are a bit more challenging. A Word About Lisencing: This purchased pattern can be used for personal use. If you would like to make additional trainers to sell, Sew Can Do requires a small fee for a commercial license. Babyville Boutique makes high-quality PUL (waterproof) fabrics in delightful prints and solid colors. 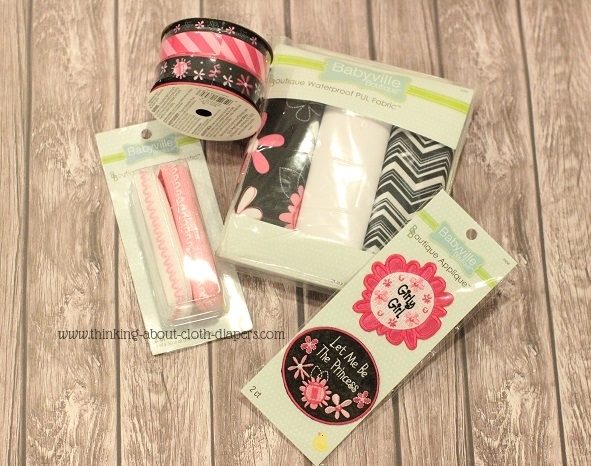 I've worked with Babyville Boutique in the past, and I love their coordinating line-up of fabrics, fold-over elastic, hook and loop tape, snaps, and embellishments. 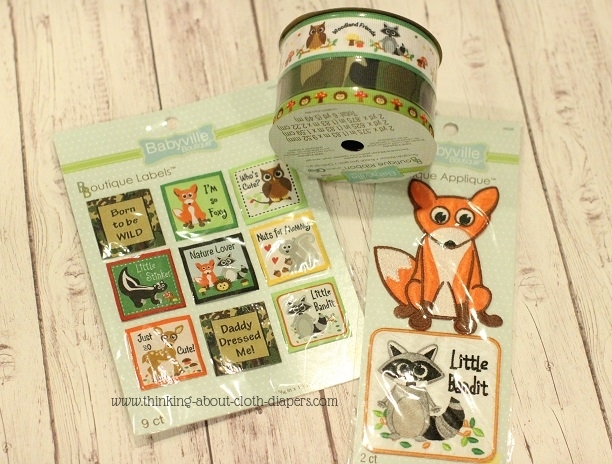 I have a special fondness for woodland creatures after doing our nursery with a fox theme, and so I was excited about the latest woodland inspired fabrics and accessories! Professionally serged, pre-made microfiber inserts topped with a stay-dry layer. These come in a package of two and are available on Amazon.com and from other fabric retailers. For anyone without a serger, this is such a great idea! Bonus - time savings! Plus, these fit inside the Sanity Saving Training Pants perfectly! Pre-cut hook and loop tabs for perfectly rounded edges on your diaper tabs! If woodland animals aren't really your thing, there are lots of other prints and solids available. I love the diaper cut packages, which include 3 coordinating fabrics. These are perfect for sewing things like trainers and diapers, so that you get a nice variety of fabrics in your diaper stash. Below is a photo of one of the more "girly" packages that is currently available. When I potty-trained my first, we bought several different brands of cloth trainers to try. Although there were several I really liked, there weren't any I absolutely loved... but this pattern from Sew Can Do brings together most of the features I would have loved to see all in one training pant! My favorite feature is the back pocket opening! This makes it easy to add an insert (or two!) for extra absorbency. Many trainers are designed with sewn-in absorbency, which can make them harder to get clean and can also take longer to dry. 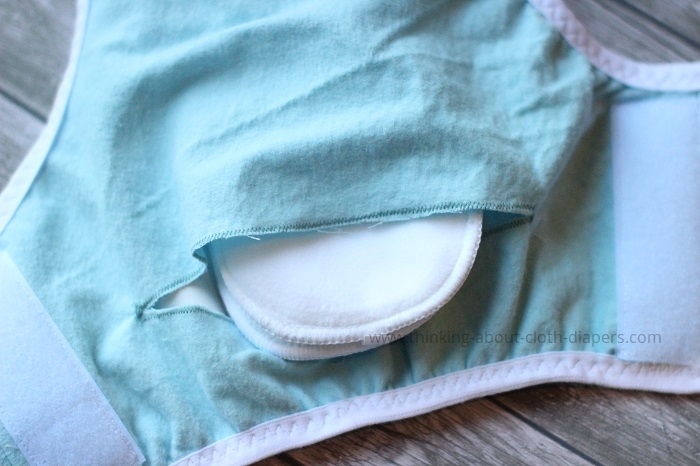 I love that the pocket feature eliminates both of these challenges, while allowing for customized absorbency depending on your little one's needs. This pattern comes with a full-color tutorial with lots of great photos. The actual sewing pattern is taped together from 5 pages, and can easily be printed in black and white. It was very simple to assemble. I had no trouble creating a trainer that looked just like the ones in her photos, either! I sometimes struggle with the sewing instructions on digital patterns, but that wasn't the case - Sew Can Do has made this pattern very straight-forward to follow. In terms of time commitment, I found that the first trainer I made took me less than an hour (and I broke a needle and used 3 different colors of thread, and wound 3 bobbins!) I can see this pattern being set up "assembly-line" style to make a larger set of trainers. These trainers can be made with either a snap or Velcro closure. If your little one likes to remove their diaper, I would suggest snaps. I tested this pattern with hook and loop since I love Velcro closures, but I may make some pairs with snaps too. For beginning potty trainers, additional absorbency can be added via the pocket opening. If you already use cloth diapers, you can add any insert you already own. 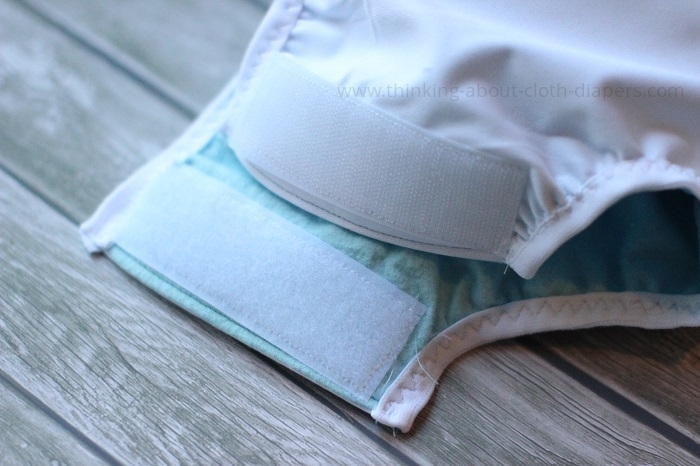 I loved the fit of the Babyville Boutique inserts in this, and as an added bonus they are topped with stay-dry fleece so if the end gets untucked, the microfiber won't dry out your baby's skin. Fold-over elastic can be a bit challenging if you've never worked with it before. The trick to getting a great fit with these trainers is to measure your little one's tummy and legs, and then cut the elastics so they will provide a snug fit. With the right elastic tension, the size range on these trainers is pretty true to specifications (22-35 lbs). At 21 lbs, my little guy didn't quite fit these yet, and they were too small for my 45 lb 5-year-old. For tips and tricks, read our article on fold-over elastic. Babyville Boutique has lots of adorable prints to work with, but I fell in love with this little fox applique patch and wanted to incorporate it. In the end, I opted to make this trainer with a diaper cut of white PUL and white fold-over elastic, and to embellish the back with the fox applique. I also added one of their small woven "labels" to the side for another fun touch! So cute! This pattern is easy to follow and I feel that the design offers features that put this trainer into "best in class" with other commercially-available trainers. Plus the materials from Babyville Boutique are affordable and high quality, helping me to save money and make my own trainers. The Sanity Saving Training Pants pattern is available as a digital download from Craftsy. It sells for a very reasonable $6.95 USD, and is available for download immediately after you pay for it. Want to win a copy of your very own? Sew Can Do and Babyville Boutique have partnered with me to bring you a great big giveaway! One lucky reader will win a copy of the Sanity Saving Training Pants pattern and $50 worth of Babyville Boutique fabrics and notions! Disclosure: I did not receive any form of compensation in exchange for this review. Babyville Boutique sent me sample fabric, and the publisher provided me with a complimentary copy of the sewing pattern for the purpose of this review. The opinions expressed in this post are entirely my own, and your experience with the product may differ from mine. I only recommend products or services I use personally and believe will be good for my readers. This article may contain affiliate links. I am disclosing this in accordance with the Federal Trade Commission’s 16 CFR, Part 255: “Guides Concerning the Use of Endorsements and Testimonials in Advertising.” For more information, see our Disclaimer and Copyright.